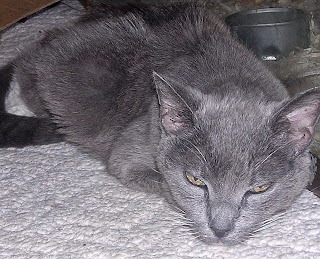 Today as my little kitty dies of VAS - Vaccine-Associated Sarcoma, I'd like to dedicate a pattern of sorts in her memory. Gracie was a fighter. I got her when, as a volunteer in the Red Cross Disaster Services Unit I responded to a house fire. The home was burned to the ground and the family - parents and several children, some quite young, were being sent to a hotel for the night. A friendly and quite pregnant little cat was threading through all of our legs, purring loudly the whole time we did the paperwork and made arrangements. As I petted her, the woman said I could have her, as she was their cat and they couldn't take her with them. I took her home and she had kittens the next day in my basement. We had our differences over the years. She bullied my beloved Ricky (male cat) unmercifully. She liked to bring live birds through the pet door to kill them in the bathroom where the mirrors confused them. Once she brought in a live snake during a dinner party and left it under the table, quickly clearing the room. But looking back I can see the humor in some of it now. I'm trying to tell myself she's not suffering the pangs of death for nothing, but they are birth pains toward a new life. I believe, as George MacDonald did, that animals don't just pass away into nothingness but are also welcomed into God's warm embrace at the end. This may perhaps be the easiest shawl pattern ever. You simply find a repeating lace pattern you like and keep going. I think good shawl dimensions are 18 - 22 inches wide by at least 36 inches long. It takes at least 380 yards, closer to 500 if you want to make it really nice. The pattern can be found in books or online. My favorite sources for lace patterns are the library - where they have books like Stitchionary that are filled with lace patterns. I prefer size 10 needles so it doesn't take forever to knit the shawl and I can use larger yarns - sport, DK, etc. and still have it with a lacy, open effect. To get the gauge, knit one repetition of the pattern through once (in this way you can also see if you can do all the stitches!). Wash and block it and then measure it to see how many repeats you'll need to get the desired width. For length, I usually keep going until I've used up all the yarn. I don't like tassels because I worry they won't hold up over time and will make the shawl start to look shabby. To class it up, you can add a knit-on or crocheted on edging on all sides. You can find many of them in pattern books as well. I wanted to put in more pictures of some examples but evidently my printer just discovered it doesn't support Vista and no longer uploads photos! GRRR! My condolences; I firmly believe our beloved pets will be with us in heaven. God, in His love, created them as He created us. We lost our beloved TC cat last week and I'm struggling to help one of my ancient sheep in his last days. I'm hand feeding him, carrying hay, water and corn to him and trying to make his last days peaceful. I strive to be a good steward. I wish you and Grace peace, comfort and blessings. Could you share with me the lace pattern directions for the pictured shawl, the name of the pattern, or where to find it? I am an intermediate beginner :) so I can't knit very difficult patterns. Thanks you, or anyone, who might help me. That particular lace pattern was one I saw in a book I got from the library. Sorry, I don't remember which book or the name of the lace pattern.